Conceal the top of the riser with TREP-TAP anodized aluminum cover profile. Designed to be integrated with TREP-S or TREP-B stair nosing profiles to cover the top of the riser and help prevent tile edges on stairs from chipping. 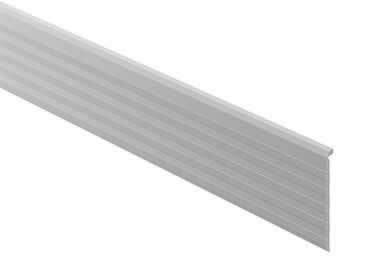 TREP-TAP comes in two widths: 2-13/32" which features horizontal grooves and a 2" width smooth surface profile. TREP-TAP is great for offices, shopping malls, public buildings and more. Profile Lengths: 98.5", 59", and 39"
Want to Learn More About TREP-S and TREP-B Slip Resistant Stair Nosing? Click Here! Installation: Apply adhesive to the riser and insert the cover profile in the support section of the TREP-S or TREP-B prior to installing the stair-nosing profile. Do not use abrasive or strong alkaline cleaning agents.